DICE have announced the details of Battlefield 3’s latest PC patch. 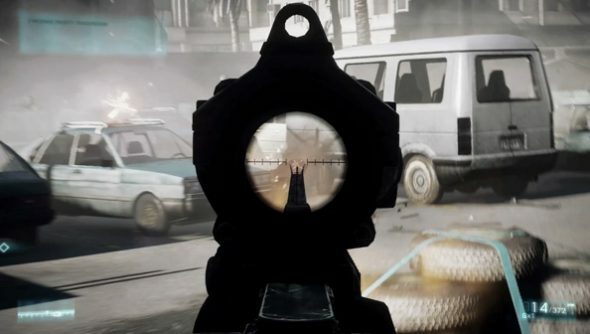 It’s time to get your head around some fairly sweeping changes to the way guns function in-game, because they’re coming, ready or not, this time next week. As a result, they’ve slightly reduced horizontal recoil for the L85A2, FAMAS and the QBZ-95B, and decreased recoil for the G53 and Type88 LMG, as well as for the first shot of the AUG to improve controllability. Conversely, the M416 and M5K have both had recoil increased, to make the choice between M16 and M416 more interesting and to balance high damage respectively. Elsewhere, accuracy has been improved in three weapons: the MP412, to distance it from the .44 Magnum; the M26 to better reflect the accuracy other shotguns; and the LSAT when firing from the hip, to “highlight the weapon’s role as a highly mobile LMG”. DICE have taken their repair tool to a number of other minor Battlefield bugs – see the changelog for more details on them. The patch will go live no later than December 4th. When it does, you’ll need to log-in to Origin and acknowledge the update via Battlelog’s Game Manager. In the meantime, let us know your thoughts on those recoil tweaks.